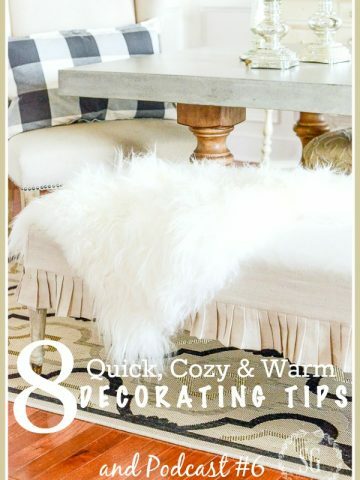 I love to take a stripped down approach when it comes to decorating during the winter. It feels like my home has room to breathe. And it also gives the bones of StoneGable a chance to shine. 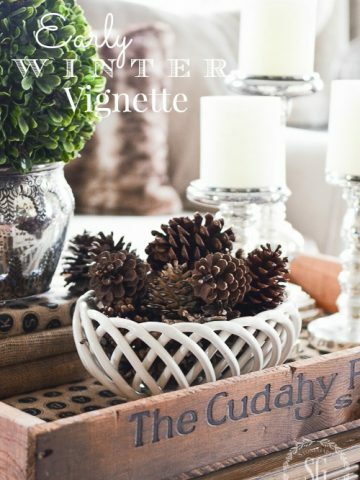 You might want to try this less is more style in your home this winter. I have some great tips to help you! After Christmas, I take everything out of a room. Every pillow, every plant, every candle. Everything but the rug, furniture, curtains and what I put on the walls. Then I sit. And look around the room and make a list of the things I might want to put back in a room. You won’t believe how much this will help you! Today we are decorating the dining room. 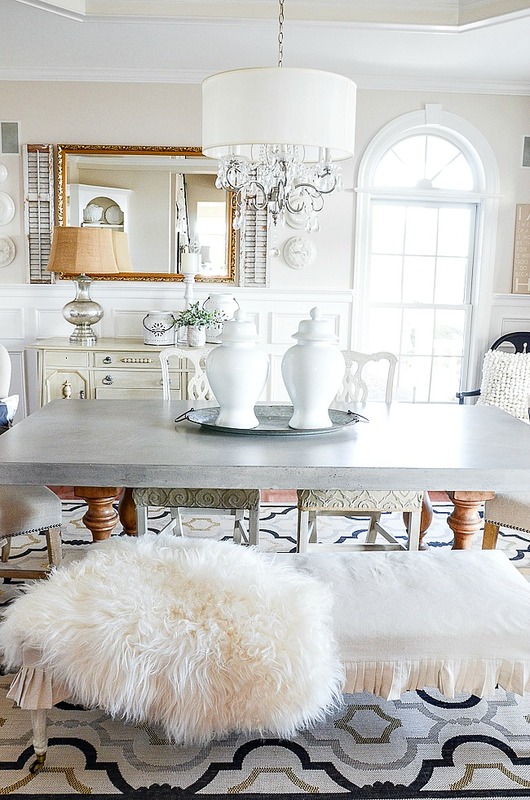 One of the first things on my list of accessories to put in the winter dining room was the Mongolian sheepskin. I would keep it on the bench all year if it did not make me hot during our sweltering summer weather! Here’s a tip that will really help you. Use your smartphone and take pictures of all the decor items you have. Put them together in a folder on your phone. Then go through what you have and make some choices. I always bring lots of options to a room I’m decorating for a new season. But most of them don’t make the cut! Oh, I love white accessories! I’ve had these sweet snowflake pottery containers for quite a while. They never stay in the basement for long! They came from the Pottery Barn Outlet. However, I’ve not seen them at our local store for a few years. Every room deserves a little green. The plant is faux and I found it at a local shop. 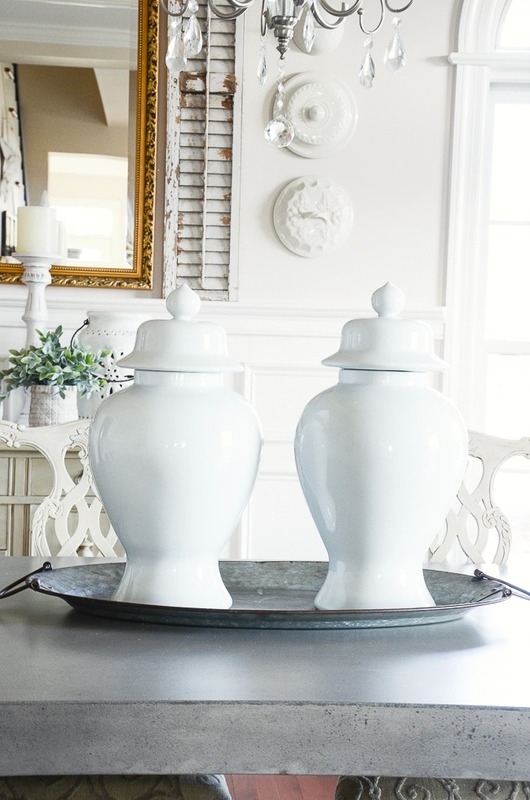 Here’s another tip to keep in mind… collect decor items in the same color family. As you can see I just LOVE white and neutrals. 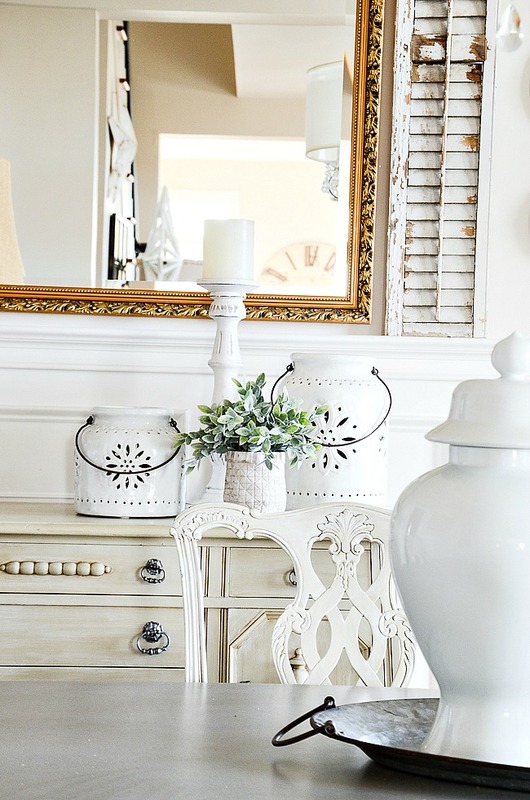 Collecting white and neutral accessories make decorating so easy. All my decor pieces work together! If you have great accessories you love but the color is all wrong, paint them! It’s amazing what a little paint can do! My dining room is serene and curated this winter. Perfect to enjoy until warmer weather knocks on my front door! How about you? 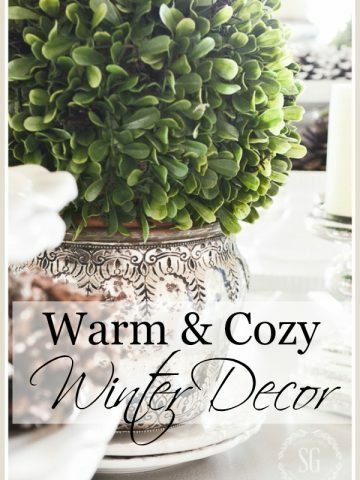 How do you like to decorate for winter? Wow, absolutely fabulous. I always love everything you do. outstanding decorative ideas. Hi Yvonne! Love your blog! Could you tell me where u found your chandelier over your dining table. Remodeling my bedroom and it’s exactly what I’ve been looking for. Soft, shiny yet refined! No, but it sounds interesting! I just discovered your blog about a month ago and I love it! What colors are your diningroom? I’ve always been a “color” person but for my new house I want to use shades of white but the choices are overwhelming! Thank you! Hi Rebecca, how fun to think about the clean slate of a new home. The wall color in my dining room is “Sonnet” by Benjamin Moore. And the trim is Atrium White also by Ben. Your dining room looks lovely, even when it is “stripped down”! It is a great idea to remove accessories from a room and gradually add items until it looks just right. I bet I would have a multitude of “stuff” to store or give away, if I tried this method!!! Who knows? I might give it a whirl. Love Love you winter decor with white, cream and a touch of black. I too love that serene, tranquil look all year long. Thank you for such sharing beautiful style. I love the dining room but I also like it with the more traditional table that you originally had. Both so pretty. LOVE the ROOM especially the rug! Where did you purchase? Such great suggestions! I need to up my game in my own house!! 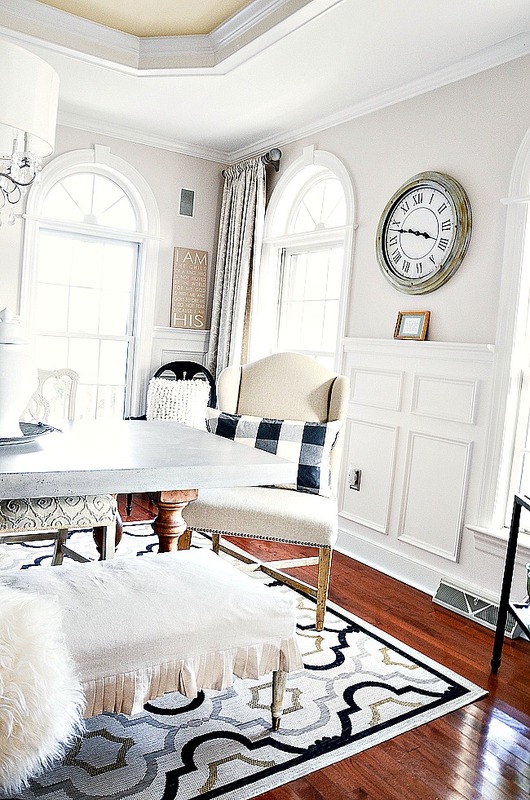 Where did you buy the rug in your dining room? Your dinning room is now ready to add color for the next entertainment. I especially like the bold black and white pillows. I am using the black and white plaid fabric for a pillow slip to use on the long body pillow for the bed. It looks great with the white bed covering. Thanks for many great ideas. Your home always looks beautiful, Yvonne. I have learned so much from your blog. I am wondering what books you have read to help you in your decorating process? I have glimpsed a few on your end tables, but don’t haves the names of their authors. I know you get a lot of inspiration from blogs. I follow you on Instagram also and have begun following some of the blogs you follow. Decorating is such a hobby of mine and admire you for your lovely taste! 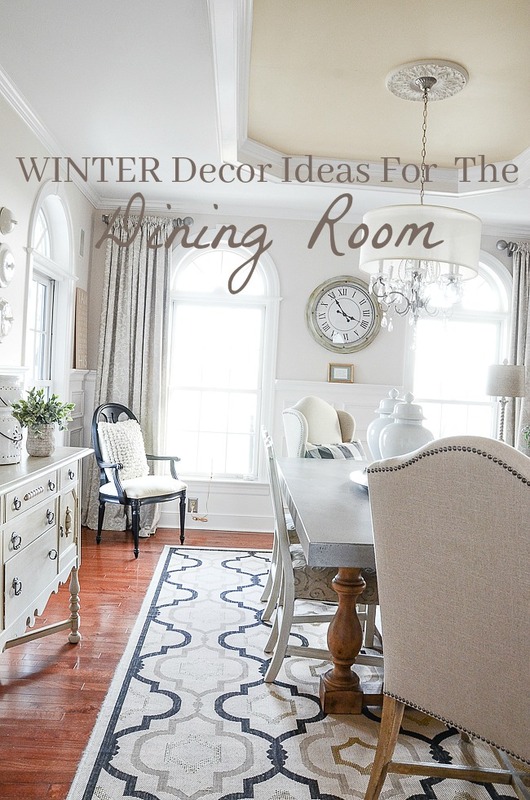 great winter ideas…white accessories are beautiful! I love the cleaner crisp look in your dining room. Sometimes a little less clutter is best in all rooms. I need to get rid of some items myself but can’t decide which ones. I wish I had more storage then I could change things around more often. Oh it looks lovely, Yvonne! So clean and crisp! Thank you for sharing these tips! I pinned it so I would have it to refer to. Beautiful! I just love your home, all the way around! We are starting a redecorating/remodeling in our home and choosing an interior color is so difficult. I’m thinking about going with white, but don’t want it to feel stark. Your dining room looks so bright and inviting, even though there’s a lot of white. What is the best way to warm-up a white room? I always love your ideas. It’s a super idea to basically clear a room after the holidays and start fresh by moving, removing, or adding decorative items. I’ve always loved your Pottery Barn snowflake lanterns. I have searched and searched for them even on sale websites such as eBay, but have never found them. Those are classic! The rug came from Ballard Design. Where did you find your drum shade for the dining room chandelier? Love it! I have a 5 bulb individually shaded chandelier that I would like to switch out with a drum shade, too! I’m always impressed by your innovative updates, Yvonne! Love the winter whites with a touch of black! Where did you get your lumbar buffalo checked pillows? Hi Carol, I just love these pillows! They are so well made. They came from Pottery Barn but I don’t see them on their site right now. Sorry, I can’t help you any more! Good morning Yvonne.I am loving todays post on clearing things out and starting fresh with a blank slate. In recent years I have taken photos of room decor so I can use them for future reference. Thanks for all your inspiration! Your concrete dining table just blows me away. So edgy and unique. Your risk taking really opens my mind to all sorts of possibilities and I love that. Classically Yvonne ? I’m glad you are open to new possibilities! I really love my dining room table! Just Fab!! I was wondering where you got the rug? Its super beautiful! I have been moving things around and shopping my house trying to get a new look.I also have started a few projects with spray paint updating some older pieces.It’s amazing how paint can change the look of an item.Going more neutral.You dining room looks beautiful, so light and bright,I so am a black and white girl, timeless. I Love home decor and trying new ideas. I have followed DTT since Episiode 1 and always enjoy the girls conversations. I am inquiring as to how you hang your stoneware lids. I have several on the wall but I’m not happy with the metal hangers I used. Thanks in advance for any information. I have some pics of Amy Howard projects I’ll send soon-love that paint. 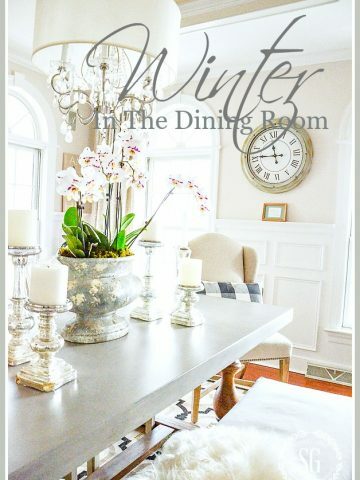 I always like when you post about your gorgeous dining room! Not only do I love the way you have it decorated but I am so envious of all the light you have in there! My dining room is north facing so it’s never that bright. Great idea to take everything out and start fresh! It’s actually hard to photograph. It is light all day! I love it but not when I am photographing/… lol! 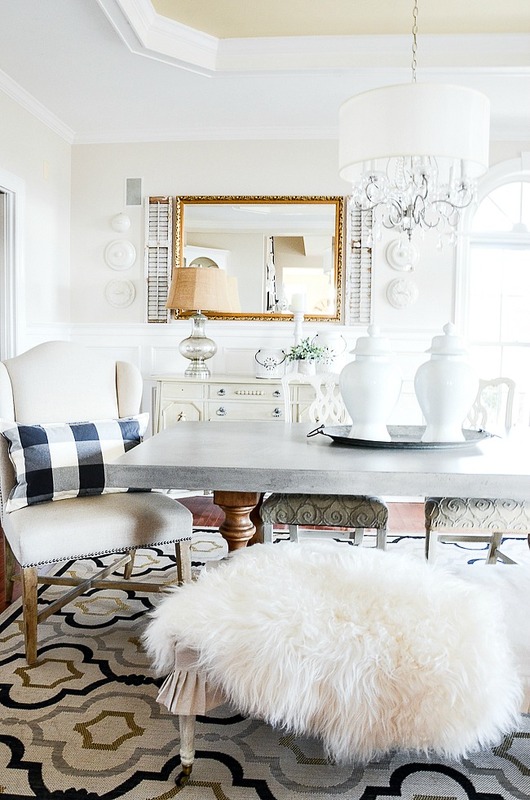 I love all the white accessories in your dining room. Everything looks so fresh! Yes Yvonne, winter is time to let my home breathe! I have simplified decor since Christmas. Our dining area flows from the kitchen as we have a fairly open plan with a big 2 sided Scandinavian fireplace that separates this area from the living room area. I have used white ironstone pitchers and a few lanterns with battery operated candles …just perfect for now! Just beautiful. I bring out my lighter colored Pendelton wool blankets and put away the darker ones. Also change from leather throw pillows to linen. Still cold winter weather but sprinkled with a few not so cold days here and there. I have never taken everything out of the room and start all over again. That is in great idea and I will try this in the spring when I am cleaning the rooms out. Thanks for the idea.